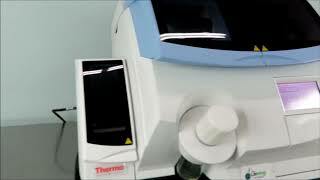 The Thermo Scientific Shandon ClearVue Coverslipper offers you simplified workflows with speedy, precise results. This histology cover slipper has safety features such as down draft ventilation and charcoal filters to protect from harmful vapors, as well as preventing operation when any instrument door is open. The Thermo ClearVue Coverslipper is compatible with a wide variety of strainers and baskets, and can process 1 to 5 together or up to 11 at a time with load on demand capabilities, allowing it to integrate into your lab setting without difficulty. This histology instrument automatically recognizes various types of slide preparations to deliver the proper amount of mountant, for both histology and cytology samples. The Thermo Scientific Shandon ClearVue Coverslipper has an intuitive user interface, with a touch screen to guide users through the selection process. The onboard software then monitors slide preparation, number of slips dispensed and baskets waiting to be processed. The ClearVue uses optical sensors to ensure proper positioning of the slide while the Vacuum and pressure are then applied to quickly and accurately mount the cover glass, with no spills and no mess. This cover slipper also features a removable debris and purge trays that allow users to clean up quickly and easily and remove excess mountant or broken glass. This Thermo Scientific Shandon ClearVue Coverslipper has been fully inspected and is performing to expectations. All of our lab equipment comes equiped with our standard warranty. Should you have any questions, please don't hesitate to contact us.